Peridot and diamond engagement ring. With a distinctive light green hue and amazing clarity, peridot engagement rings are becoming more and more popular as an alternative to darker emeralds, but their bright beauty makes them an attractive option for any couple interested in a gemstone engagement ring other than a diamond. Peridot (pronounced pear-a-dough) is an iron magnesium silicate mineral and the gem form of olivine. The amount of iron in the gem's crystal structure determines its exact hue of light green (the gem is not found in any other color): peridot ranges from a very light, citrus-like yellow-green or gold-green to a darker brownish green. The trace amounts of nickel and chromium in the crystal can also affect its color. Natural peridot is found throughout the world, with the highest quality deposits located in Egypt. The United States is the leading supplier of peridot, and 80-95 percent of the world's supply is mined in Arizona, though the stones are generally of low or moderate quality but still suitable for gemstone jewelry. Other deposits are found in Hawaii, Germany, Mexico, and Brazil. In 1912, peridot was designated as the August birthstone, and it makes an attractive option for couples interested in the symbolism of linking their engagement ring with a particular month. Peridot has been popular for millennia, and in fact the gem derives its name from the Greek word peridona which means "to give richness." With the gem's long history and association with richly spiritual cultures such as the Egyptians and Greeks, it is no surprise that peridot has a number of mystic properties. Peridot is thought to enhance success, peace, and health, while it also provides good luck and protection to the wearer - all qualities well-suited to an engagement ring. The light, unusual color of genuine peridot is popular with many different ring designs, but it is particularly suitable for vintage, art deco, and antique styles that are well known for their vibrant use of color. Prong settings are the most popular because they accentuate the lightness of the ring, but bezels are another popular option because they protect the gem more thoroughly. Peridot is also found in figural rings, frequently as leaf accents to a floral or winding vine design.Peridot is not usually found as a solitaire, but the stone pairs well with diamonds or pearls for additional accents, and many designs also pair it with citrine, emeralds, or other gems in the green and yellow color families for smooth color blends. 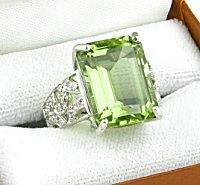 At the same time, peridot is popular to match with amethyst for a startling contract of unusual shades. Because the gem has hints of gold and yellow, it works well with many different precious metals, including yellow gold, white gold, and silver. Some peridot engagement rings can be found set in platinum, but that is less common because the metal can drastically increase the price of the ring. 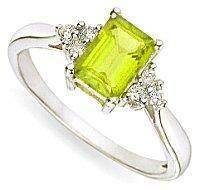 The most important characteristic for judging the quality of peridot engagement rings is the color of the stone. Bright hues with more yellow than brown tinting are the most desirable, but interested couples should verify that the stone is natural and not treated to enhance its color. The color should also be consistent throughout the gem without shifts or shadows. Because the gem is so light-colored, clarity is also important because flaws will be more visible. Peridot is a relatively soft gem and can be scratched, nicked, or chipped more easily than other semi-precious gems. Because of this, the ring should be designed carefully to care for the stone - the setting should be even and well-protected, and the engagement ring should not be paired with a wedding band that could rub against or scratch the gem. Like all birthstones, it is easier to find peridot during its assigned month. Because of the gem's rising popularity, however, most jewelers carry a limited supply throughout the year. While smaller gems are abundant, many of them are set in bracelets or earrings rather than rings, and it can be difficult to find a larger stone suitable for an engagement ring; most cut peridot gems are less than two carats in weight. Investigating online merchants is another option for couples interested in a peridot engagement ring but who do not have a wide selection available locally. Peridot rings are a stunningly beautiful alternative to darker green gems. Rich with symbolism from their long use in jewelry, the gems are both attractive and meaningful, and the most meaningful use of all will be choosing just the perfect peridot to present to a cherished bride-to-be.